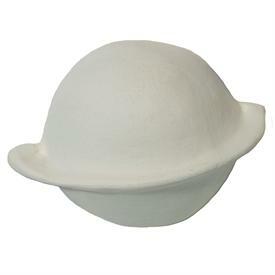 Clay Planet's LFW is a very smooth, easy to work, white low fire earthenware clay for school and professionals alike. Plastic enough for wheel throwing; also fine for hand building kids school projects. Usually fired between cone 06 and cone 03. Very popular for children's hand prints! It is a low fire clay, so fire to any earthenware temp. It's possible to be fired up to Cone 2 for even greater strength depending on your needs. When fired to cone 1-2 it has a ring and vitrosity similar to higher fired clay bodies. Do not fire your low fire glazes to cones higher than what the label states without thorough testing.